Product #3143 | SKU H-F007014E | 0.0 (no ratings yet) Thanks for your rating! 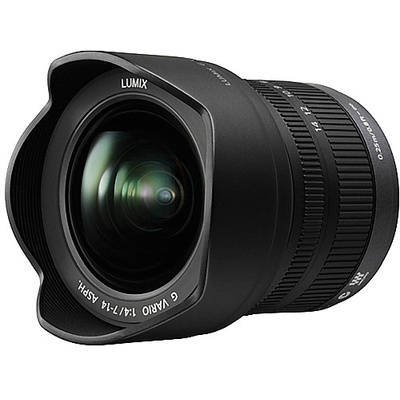 Interchangeable ultra wide-angle zoom lens, LUMIX G VARIO 7-14mm/F4.0 ASPH. In spite of its impressive wide-angle zoom range of 7-14mm (35mm camera equivalent; 14-28mm), the lens is surprisingly compact and lightweight for casual on-the-go use. Taking advantage of its wide, 114-degree angle of view, users can easily fit subjects into the frame even when shooting indoors where the distance is limited. The world looks extraordinary when viewed through the new lens, allowing photos and movies to be recorded with a uniquely rich perspective. When mounted on LUMIX G Micro System Camera, the lens allows use of the advanced contrast AF system, which includes a Face Recognition function, for more convenient, more enjoyable shooting. Seven blades give the aperture a rounded shape that produces an attractively smooth effect in out-of-focus areas when shooting at larger aperture settings. The LUMIX G VARIO 7-14mm/F4.0 ASPH. lens also features a highly reliable metal mount, and uses multi-coated lens elements that minimize ghosts and flare to further enhance its optical performance. The optimally designed lens hood enables use even under strong sunlight.